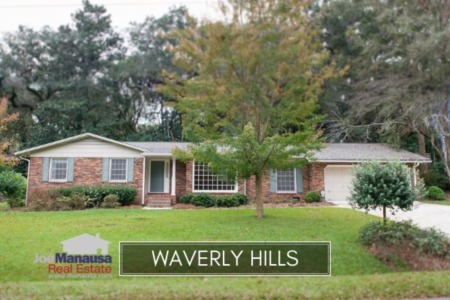 With over 400 homes on more than 400 acres, Waverly Hills is a popular neighborhood in the center of the Tallahassee real estate market. Rolling (or perhaps waverly) hills, streams, magnolia trees and majestic oak trees create an environment that many homeowners seek when they move to Tallahassee. As part of our continuing review of neighborhoods in Tallahassee, today we will analyze home sales in Waverly Hills from the Tallahassee MLS in order to spot trends and to establish expectations for people who might need to sell a home in Waverly Hills. 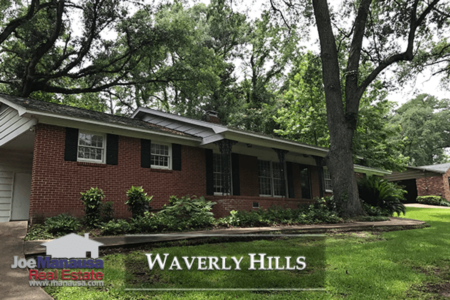 The average sales price of a home in Waverly Hills this year (only two sales thus far) is $236,000, which is 36% lower than the $367,516 average that was recorded during the peak of the market in 2006. Since homes come in an array of sized in Waverly Hills, this does not necessarily mean that home values are down 36%, it is just an indication that what is selling is going at a lower price than what has been seen in the past. Who would have ever thought a day would come where a headline would read "Values Down 23%" in a Tallahassee neighborhood? Moreover, who would have ever seen that as good news? That's right, single family home values across the Tallahassee housing market are down about 30% since the peak of the market, so the 23% decline in Waverly Hills means that this neighborhood is beating the market! Currently, there are 12 homes for sale in Waverly Hills, and one undeveloped lot. Like with the rest of the Tallahassee real estate market, home sellers in Waverly Hills will be facing falling values and plentiful competition, but if the past is any sign of things to come, these home sellers will out-perform the rest of the Tallahassee housing market. The following is a list of recent home sales in Waverly Hills from the Tallahassee MLS.